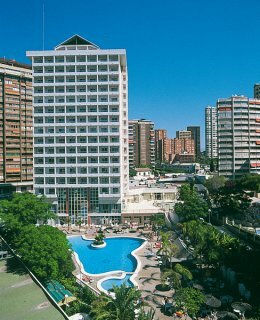 The Poseidon Palace is centrally located close to the old town of Benidorm. Levante Beach is also very close by. The Poseidon is a modern hotel and offers a high standard of comfort and ambience. All bedrooms have bathroom, terrace, telephone, air conditioning and television. The hotel's facilities include indoor heated pool, Jacuzzi and gym. The hotel offers daily sports activities and evening entertainment.